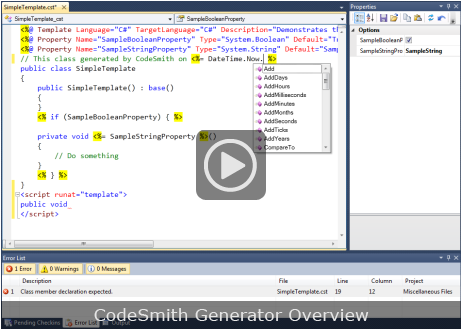 CodeSmith Generator is a software development tool to help you get your job done faster. Technically speaking it is a template driven source code generator that automates the creation of common application source code for any language (C#, Java, VB, PHP, ASP.NET, SQL, etc.). CodeSmith Generator includes many useful templates as well as entire sets of templates for generating proven architectures (.netTiers, CSLA, NHibernate, PLINQO, Entity Framework, Kinetic Framework and more). You can easily modify any templates or write your own to generate your code exactly the way you want it.